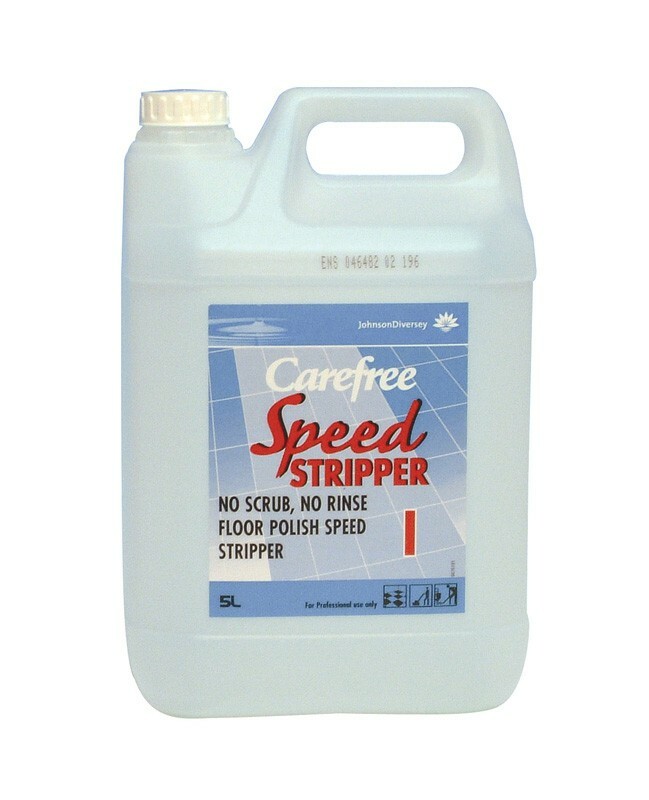 Carefree Speed Stripper is a no scrub, no rinse floor polish speed stripper for use on all resilient floors (excluding wood). Its revolutionary formulation can cut stripping time by 50% when compare to other polish strippers available on the market. The solution can be applied with a kentucky mop or polish applicator, and can be used with or without the help of a rotary floor machine. Suitable for use on all floor types (excluding wood). Dilute 1 to 5 parts with water (1000ml per 5ltr). Stronger concentrations of up to 1 to 3 parts (1650ml per 5ltr) may be needed for floors with a heavy build up of polish. Spread the solution evenly over the floor with a suitable applicator. Leave for 5 minutes, break up softened polish by agitation, leave for a further 5 minutes - do not allow to dry out. Remove slurry with applicator or wet pick up machine. Damp mop to remove any residues and leave floor to dry. For spray stripping: Dilute 1 to 20 parts (250ml per 5ltr) with water, spray and scrub with a stripping grade (black) floor pad. Please Note: Do not use on unsealed wood or painted surfaces. Always test on lino for colourfastness before use.